On Saturday May, 21 Herman Cain announced his candidacy for President of The United States. Here is the shaky phone cam video from my point of view! If you haven't heard of Herman Cain or you are wondering what all the excitement is about, Here is a link to the entire 30 minute speech as seen on c-span. In addition to the excitement of the announcement itself, Mr Cain gives some very clear views of his views on energy independence, job growth and creation, and foreign policy. 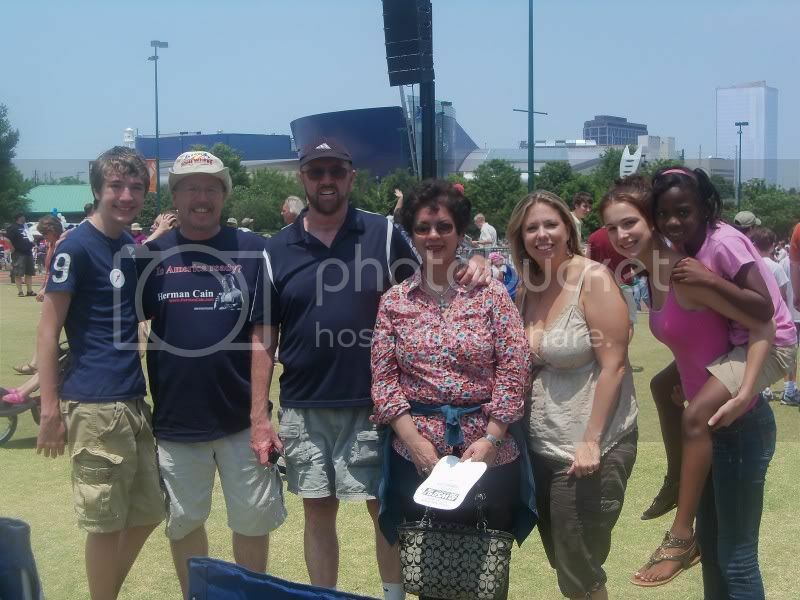 We made a family event and went to the rally at Atlanta's Centennial Olympic Park. My son Ryan, Me, Jim Southard(my dad), my step mom Elvira Southard, my wife Barbara, my daughter Tori, and her boyfriends sister Amari. Boyfriend Marcus was behind the camera.